KLENK 2011 PROGRAM & REGISTRATION INFORMATION: DEADLINE JANUARY 2, 2012!! invite all who share a love of Estonia and Estonian culture to KLENK 2011, which will be held Friday-Saturday, January 6-7, 2012, in St. Petersburg, Florida. Registrants may pick up their nametags, programs and songbooks/laulikud after 3:00 pm Friday afternoon in the Nautilus Room of the Conference Center. We will start our program at 5:00 pm Friday afternoon and continue all day Saturday and Saturday evening. The annual KLENK business meeting and planning session will be held at 10:00 am Sunday morning, January 8, 2012; the results of the recent ERKÜ survey will enlighten that conversation. View the KLENK 2011 program by clicking on this link: KLENK 2011 Program/Kava, updated January 3, 2012. Come a few days early or linger a few days longer, we have lots of area attractions to offer KLENK participants (please view our link to area attractions on this web site). Need assistance? Former KFES President Henn Rebane is offering “concierge services.” Send Henn an email at henn@rebane.com. (Shortcut to the KLENK 2011 Registration Form). Founded in 1958, this will be the 54th year that KLENK (Estonian Society of the Midwest) hosts its annual conference on Estonian culture and fellowship. By popular vote at KLENK 2010 in Chicago, KLENK members decided to host KLENK 2011 outside its traditional Thanksgiving weekend midwestern region. For the first time, KLENK will be co-hosted by the Kesk Florida Eesti Selts (Estonian Society of Central Florida) and the Lõuna Florida Eestlaste Koondis (Estonian National Association of South Florida). To take advantage of the sub-tropical Florida setting, the conference will be held in the Magnuson Hotel Marina Cove, 6800 Sunshine Skyway Lane, St. Petersburg, Florida 33711, which is located on beautiful Tampa Bay at the Sunshine Skyway Bridge. With its sandy beach, heated swimming pool, children’s playground, and setting on Tampa Bay, we hope KLENK participants will find the favorable nightly rate of $79 enticing ($88.48 total per room per night including taxes, up to four occupants at no additional charge). Parking and resort fees are included in the hotel rate. The rate applies up to three days prior to the start of the conference and may be continued up to three days after the conference. Check-in is 4:00 pm; let the hotel know if your travel plans call for an earlier check-in. Call the hotel directly to make your reservation; telephone toll free 800.227.8045; direct 727.867.1151. Let the reservations agent know you are attending the “Estonian Conference.” Hotel reservations must be made by December 16, 2011 to receive the favorable rate in a block of rooms reserved for this conference. If you would like assistance planning activities before or after KLENK, former KFES President Henn Rebane is offering “concierge services.” Send Henn an email at henn@rebane.com. Lectures, music, dance and theatre: All those are the elements of the KLENK 2011 program. We will celebrate our Estonian heritage, hear from Estonians and Estonian Americans at work in the US and Eesti, and look to our future. To welcome all comers and Estophiles, most lectures will be in English as we honor the Estonian language in our conversations and celebrations. To remember KLENK founders who passed away in 2011, a special memorial service will initiate our weekend. KLENK 2011 will also provide an opportunity for friends to renew old acquaintances. 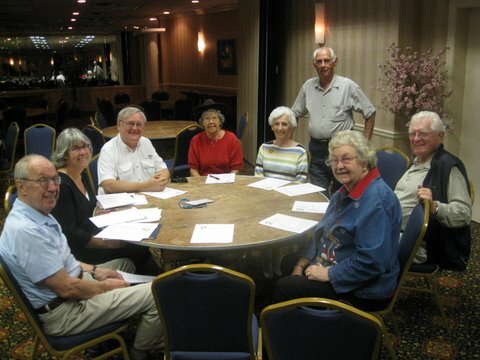 We hope those who shared their childhood and early adulthood in places like Augsburg, Geislingen, and other post-war locations will join those organizing reunion tables around this meeting. KLENK SPONSORS: We are grateful to these association sponsors of our meeting: Estonian American National Council (ERKÜ), Estonian Society of Central Florida (KFES), Estonian National Association of South Florida (LFEK), Eesti Abistamiskomitee for their support of Saare Vikat, and the Estonian Evangelical Lutheran Church-Central Florida (E.E.L.K.-Kesk Florida). Individual sponsorships have been provided by Jaan and Maare Kuuskvere, Lisa Mets and Erkki Taada, and Sigrid Bratic (Little Greek Restaurant). REGISTRATION: Please complete and mail the KLENK 2011 Registration Form. To be included in meal counts, registrations must be received by January 2, 2012. No refunds can be given after January 2, 2012.